In view of the occasion, I will write a short article about a very common way and procedure to make a memory check and to find out if you have installed a faulty RAM Module in your System. A friend called me today and told me that he has some trouble with his computer. He told me about several system crashes and blue screens. You maybe know that this could happen because of several reasons. It might be a faulty memory module but it could be another hardware defect or even a driver problem as well. But those blue screens usually give you a hint. It is always a good idea to write down what the blue screen says or just make a photo with your smart phone. This is the way you can ask google for the error message later. And sometimes it will help you to find the problem or at least a direction where to search. But I do not want to write too generalized here about various system error´s. This small article is for those who became already suspicious, I mean for those who already suspect to have a damaged RAM module in the system. 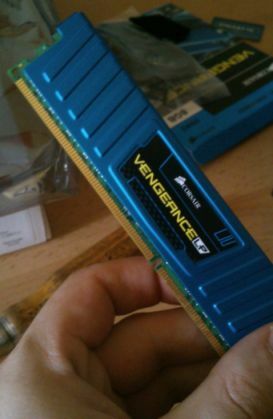 My friend didn´t have an idea how he could find out if one of his memory modules is really damaged. I asked him if he can reproduce the error message, I mean if this specific error comes always again in the same moment and he said yes. This is the best case we can have if we expect to have a damaged RAM module, really! Most systems today have more than one memory module installed and in the case of my friends system, there are four modules installed on his motherboard. This is great due to the reason that we can cut it down. If we have two or four modules installed, then we should now just install one individual and boot up the system to do what we did when the error message appeared earlier. We reproduce the exact same situation to find out if the problem still occurs. Indeed, we do this with each individual memory module. This is the easiest and most common method of elimination. If the memory issues only occurs with one individual or particular RAM module, then you got your delinquent. But be careful. If you found it, it don´t has to be a damaged module. It could even be dust on your ram contact. Blowing on the contacts of the module can do wonders. You maybe laugh now, but dust can cause error´s and did so in the past when I repaired systems of family and friends. What I want to say is, that you should not put your memory to the trash, just because you think you found the issue. Always calm down. Computer problems are complex and sometimes favorable later on they can make you laugh because you later think the problem was so obviously or strange. But if you made a wrong decision, and bought new components too fast, it can make you cry. It´s so complex that I really can´t and won´t write about all issues related to computer´s or RAM modules in this article. I will do this divided in other blog posts in the future. This article is about checking memory or to find out if one of our memory modules suddenly creates trouble and how we can find out if one of them is responsible for a particular issue. But now let´s assume we can´t reproduce the particular issue or let´s assume there issue occurs randomly. How could we then find out if and which memory module causes the problem? Right, the method above was just a very basic way and a very common and fast way to check for a faulty memory. But if we can´t expect the issue on a predetermined time or task, then it is hopeless to go the route, testing each individual alone. Then we need a bigger gun. And this gun is a software and called Memtest86. You can either download an image for a boot-able CD, boot-able Floppy and one of the modern and cool ways, a boot-able USB image. You later can boot up the tool depending which method you choose. This nifty tool is basically a stress test for memory failures detection and does not need a . The tool is boot-able by itself depending on the mentioned packages and ways to boot you choose. They also have instructions on their website, so that you can learn how to set up the boot-able image and so that you learn how to use this tool. RAM chips consist of a large array of tightly packed memory cells, one for each bit of data. This tool basically writes on any of your memory cells to help you find out if there are defective memory cells. If you have more than one memory module, then it is again a good advice to test each of them individual and not all together! Also please read “Troubleshooting Memory Errors” in the instructions to understand that a by the tool spotted error could still be caused by other hardware! However, most with the tool found failures will be due to a problem with a memory module. It is also worth to mention that this memory check can take some time because the tool writes on every cell several times. And again… never be too fast with your decisions. Don´t just jump out to buy new RAM because you think you found the failure. Always calm down and be patient. Seeking an issue can for sure create headache but some people see it also as fun and as an adventure. Repairing systems and finding issues, is sometimes complex and difficult with modern systems. But if you found the error, it can give you this “WoW, I did it.. I found it!” feeling, you know? My friend found the error, and experienced this feeling. “Yes, we got it!”. This tutorial is not meant to be the master guide for your particular issue. This guide is meant to give you some simple ideas and methods, how to find more clarity if you have the impression that your memory in the system is faulty. Hope you found this article to be useful.